Lightweight, compact, yet powerful in design. 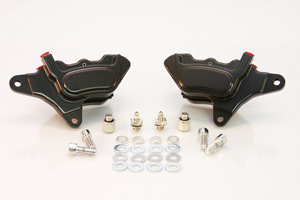 This four piston billet constructed caliper is in demand. It uses four 1-1/4" diameter centerless ground, anodized pistons. Don't let the size fool you, it's small but efficient! The four pistons deliver ultimate braking power. Fits all models from late 1984-1999. 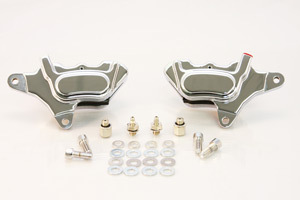 This 4-piston caliper is used with stock HD brake line and is designed to accept 10mm (3/8-24) banjo bolt.